Loganville High School FBLA had a great turn out at their first October meeting where they had a friendly competition of “Minute to Win It” games. 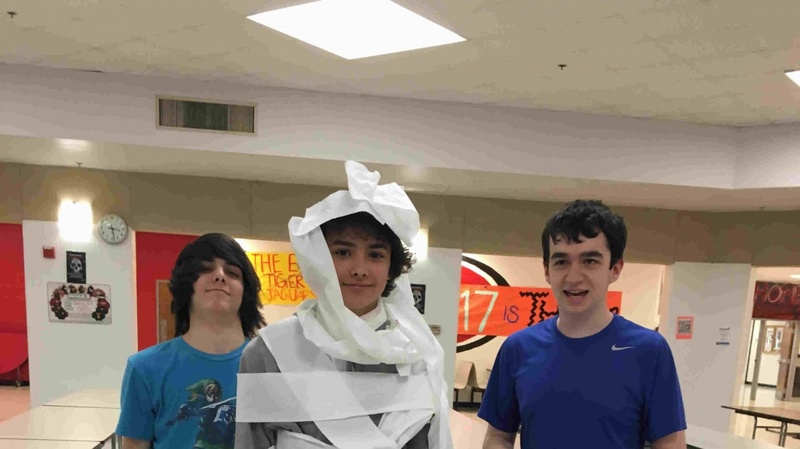 Members worked in groups, racing against the timer, to accomplish challenges such as assembling a puzzle, moving a cookie from their foreheads to their mouth, wrapping a member as a mummy, balloon games, and more. Hardaway High School’s FBLA Chapter teamed up with another local school for a heartfelt community project. Chester Jackson is a citizen of Columbus who assembles bikes at his auto shop; when he’s not working on automobiles, he gives them to children in the area who are in need. Recently, thieves have been seen on surveillance camera stealing the bikes, at night, he has restored. The story of Mr. Jackson’s plight was sent to The Today Show. Jeff Rossen came to Columbus and did a feature story about Chester and what he does for our community. NBC along with The Boys and Girls Club of Columbus set up a surprise Rally for Mr. Jackson. 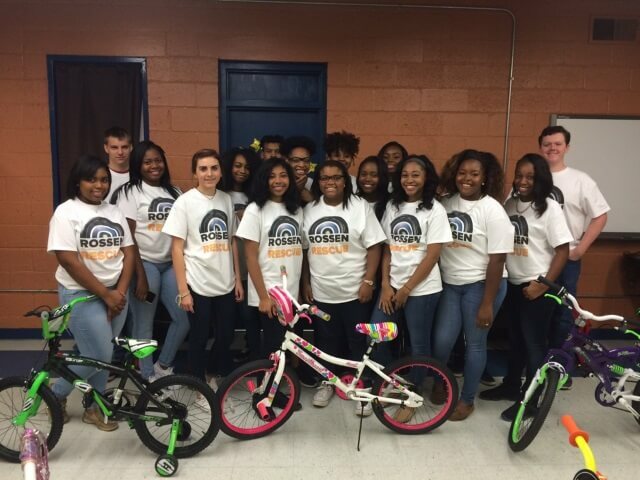 Hardaway FBLA participated in the rally and helped to present Mr. Jackson and 50 lucky kids from the Boys and Girls Club with new bikes. This event was broadcasted live on Wednesday, October 7th on NBC’s The Today show and was featured as a Jeff Rossen Report. On October 15, 2015, 13 Montgomery County High School (MCHS) students attended the Georgia FBLA Fall Motivational Rally at the Georgia National Fair. Students got the chance to see some great examples of American entrepreneurship from the multitude of fair vendors. In addition, they enjoyed great food, AWESOME stomach flipping rides, and a surprising performances by special celebrity guest, Silento, who happens to be a fellow member of Georgia FBLA! Habitat and FBLA – A Good Team! 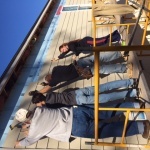 Hart County High School FBLA members volunteered to give up their Saturday to work with other Habitat for Humanity volunteers on October 17, 2015. 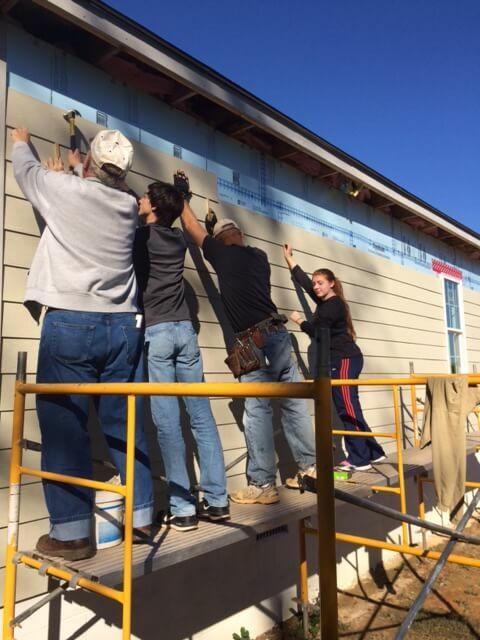 A few students, along with their adviser Coach Harris, worked 3.5 hours by putting hardy board on a house in their community for a deserving family who will hopefully take ownership of the house and move in by Thanksgiving. The exterior is very close to being finished, but a lot of painting and few details remain to be completed on the inside. It was a rewarding experience and Hart County FBLA looks forward to working with Habitat again to help complete the house. 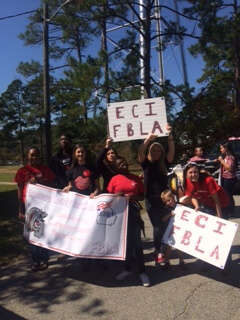 The Emanuel County Institute FBLA recently participated in the annual Homecoming parade on Friday, October 16. Participants created posters advertising FBLA and supporting the Bulldogs!